A few years ago I started making "MAGIC BLANKETS" in order to keep my yarn stash / scraps under control. 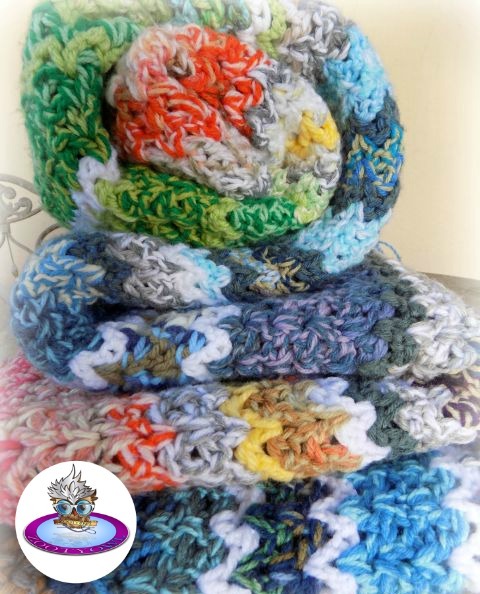 The Magic Blanket concept is a combination of two techniques: "Multi Stranding" and "Magic Knotting". Multi stranding is a clever way to rid your stash of those "what was I thinking?" and/or "why did I buy so much of this?" yarns, by toning down brights with a pastel or neutral; or brightening dull and/or dark colours with something fun and splashy. If you have never crocheted with two or more strands before, Red Heart Yarn's GUIDE TO MULTI STRAND CROCHET is a good read to acquaint yourself with the technique. 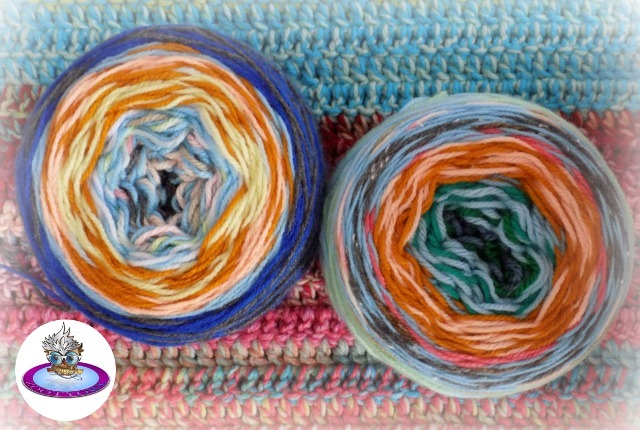 Combine the Multi Strand Technique with the MAGIC KNOT and you have THE perfect solution to the yarn scrap problem. Knot together small lengths of yarn and then wind the "new" yarn into balls or cakes. IMPORTANT!! : Be sure to check each knot properly before and after you snip the threads. I have been using this technique for years and every now and then I botch a knot (especially when I am a bit tired). If the knot is done correctly it will hold as long as the yarn holds. These soft and squishy Magic Blankets are robust and very, very warm. 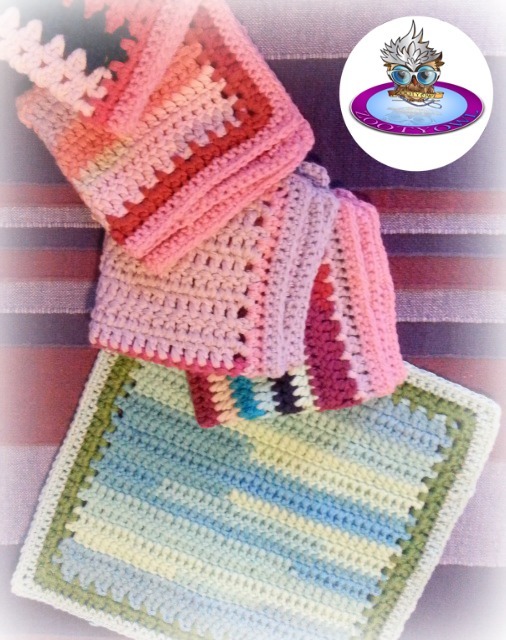 They are ideal donations for newborn babies of underprivileged mommies, the homeless and patients with dementia. Knot together cotton scraps. 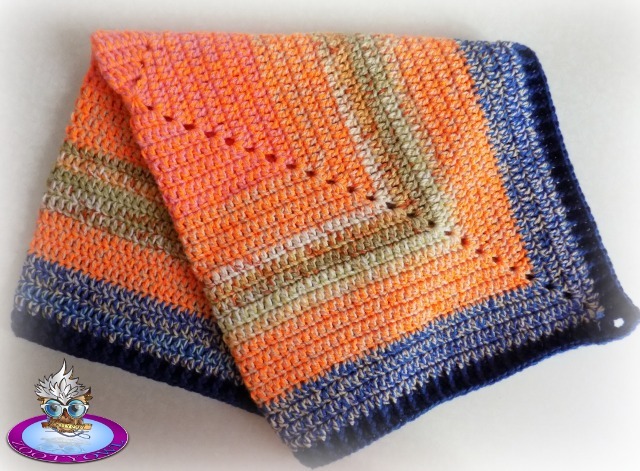 Use a single strand of Magic Yarn to make wash cloths. These little cloths are wonderfully soft. I add a pretty printed note, roll them up and slip them into a cellophane bag, before I donate them to be added to the gift packs for the new mommies at the provincial hospital. 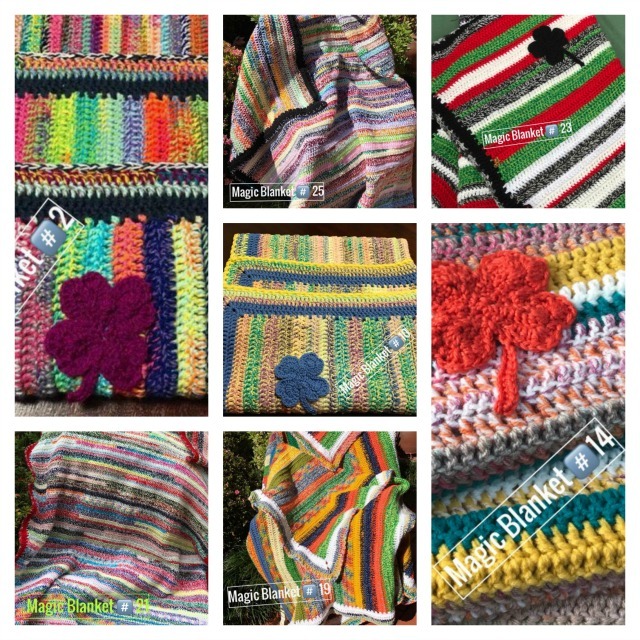 There is a good chance that my friend Kim Ryan from Australia loves making Magic Blankets even more than I do. She has made so many for the homeless that an Estate Agent in her hometown has undertaken to sponsor her yarn!! These are just a few of gorgeous blankets Kim has made and donated to the Salvation Army for distribution to the homeless. For more photos visit KIM'S FACEBOOK GROUP where Kim and fellow MB-ers share their colourful makes. Should I wash the blanket before I donate it? That is a matter of preference. I always wash mine since I mostly make blankets for Hospice and Babies born to underprivileged mommy's. A freshly laundered blanket is just an added personal touch. How do I wash the Magic Blanket? An acrylic blanket (or blanket made from yarns with no more than 30% natural fibre content) can be washed in the washing machine on a "gentle" cycle, using a gentle washing agent. Liquid laundry detergent works the best, as powders often adhere to the fibres and leave them a bit scratchy. A cold water wash is best (you can use the warm cycle as long as the water is not hotter than 30 degrees celcius). Put the blanket in with other soft washing such as towels and t-shirts. Be careful not to put anything in the wash that has hooks, buttons or zips. I always add Fabric Softner to the rinse. Spin on gentle cycle. Fold the blanket over the line so that the weight is distributed equally. Once dry I like to give it a short spin in the tumbledryer with an anti-static sheet (such as Cherubs) for 20 - 30 minutes on high. Tip: If the blankets are intended for a healthy baby, I then give them a spray with some gently fragranced baby linen spray before packing them in plastic. Note: This method of washing is for healthy, full term babies. Always check with your local NICU what their requirements are for preemie blankets or for babies with special needs. What yarn can I use? Yarns with less than 30% natural fibre content are preferable to avoid shrinkage and to limit special laundry requirements. I have mixed acrylic / cotton; acrylic / wool and acrylic yarns together with great success. What weight of yarn can I use? Any weight as long as the combined weight of the strands worked together is equal throughout. 16ply is my go to weight. This can be made up of 2 strands of 4 ply plus 1 strand of 8ply (DK); or 1 strand of chunky (12 ply) and 1 strand of 4ply, or 2 strands of 8ply (DK), etc. Do I work with one combined "Magic Ball" or two separate balls? Once again, a matter of preference. I find it more convenient to roll the strands together into one ball. This makes the project much easier to carry along with you. How do I get the sides to look neat? In order to get an even side edge ch 2, insert hook in second ch from hook, pull a loop up (2 loops on hook), insert hook where 1st stitch should be, pull a loop up (3 loops on hook) now complete your dc. This works a charm but I don't use it for my patterns as a lot of people struggle with where to put the border stitches. Do I crochet a border around the blanket? I would say YES! A blanket with a border around looks finished and is much neater. What is the easiest way to border the blanket? along bottom and top skip 2 dc posts between 3ch, sc. 2nd row 3dc into each 3ch, corner 3dc, 3ch, 3dc. 3rd row, into each sp between 3dc groups, 3ch, 2dc, sl st into next sp, repeat along all sides. These two rows give you a neat foundation with which to work. You can either add a simple edge after the second row, or work more border rounds. Which patterns are suitable for Magic Blankets? Again a matter of preference. I prefer to use something very simple. My top choice is the double crochet stripe. No matter how colourful your yarn, the dc stripe always turns out lovely! The "v-stitch" stripe is also suitable. I use this when I have longer colour changes in my Magic Yarn. A SOLID CONTINUOUS SQUARE is just the ticket when you are not sure "how much" blanket you are going to get for your Magic Yarn. 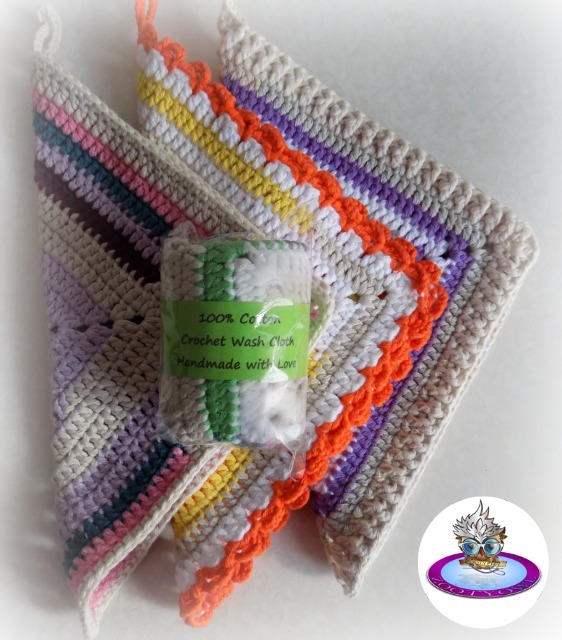 The solid continuous square is also suitable for making wash cloths from Magic Cotton Yarn. I hope this answers most of your questions. If you would like to know anything more, please leave me a comment or hop on over to Kim's Group and join in the fun! I love this idea! The link for the magic knot didn't work for me and I would love to learn how to do it! I was able to finally get to the link. Thanks for sharing and I can't wait to start on my first Magic Blanket!! Zelna a wonderful blog post, and Thankyou. Yes I am certainly addicted. I think between us we have started a worldwide de-stash MB craze. I do know some members from my FB page have advised they have used one ball of any weight along with one ball of the same weight for a blanket and it crochets up beautifully. Their advise is as long as one ball is a consistent weight the other can be anything. Hi Shaelyn! For a baby blanket I would normally make 102 ch (=100dc) and about 60 rows to get a square blanket. For a lapghan 142ch (=140dc) and about 90 rows. Thankyou - have already made 2 they are addictive. Hi Holly - usually a 7.00mm hook. For some brands the DK is much thicker (e.g Elle Charity) - then I will rather use an 8.00mm.